"Lichi" redirects here. For the Cuban-born Mexican writer, see Eliseo Alberto. Lychee (US: /ˈliːˌtʃiː/ LEE-chee; UK: /ˈlaɪˌtʃiː/ LIE-chee; Litchi chinensis; Chinese: 荔枝; pinyin: lìzhī) is the sole member of the genus Litchi in the soapberry family, Sapindaceae. It is a tropical tree native to the Guangdong and Fujian provinces of China, where cultivation is documented from 1059 AD. China is the main producer of lychees, followed by India, other countries in Southeast Asia, the Indian Subcontinent and South Africa. A tall evergreen tree, the lychee bears small fleshy fruits. The outside of the fruit is pink-red, roughly textured and inedible, covering sweet flesh eaten in many different dessert dishes. Lychee seeds contain methylenecyclopropylglycine which can cause hypoglycemia associated with outbreaks of encephalopathy in undernourished Indian and Vietnamese children who had consumed lychee fruit. Litchi chinensis is the sole member of the genus Litchi in the soapberry family, Sapindaceae. It was described and named by French naturalist Pierre Sonnerat in his account "Voyage aux Indes orientales et à la Chine, fait depuis 1774 jusqu'à 1781" (translation: "Voyage to the East Indies and China, made between 1774 and 1781"), which was published in 1782. There are three subspecies, determined by flower arrangement, twig thickness, fruit, and number of stamens. Litchi chinensis subsp. chinensis is the only commercialized lychee. It grows wild in southern China, northern Vietnam, and Cambodia. It has thin twigs, flowers typically have six stamens, fruit are smooth or with protuberances up to 2 mm (0.079 in). Litchi chinensis subsp. philippinensis (Radlk.) Leenh. It is common in the wild in the Philippines and rarely cultivated. 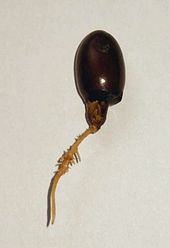 It has thin twigs, six to seven stamens, long oval fruit with spiky protuberances up to 3 mm (0.12 in). Litchi chinensis subsp. javensis. It is only known in cultivation, in Malaysia and Indonesia. It has thick twigs, flowers with seven to eleven stamens in sessile clusters, smooth fruit with protuberances up to 1 mm (0.039 in). Litchi chinensis is an evergreen tree that is frequently less than 15 m (49 ft) tall, sometimes reaching 28 m (92 ft). The bark is grey-black, the branches a brownish-red. Its evergreen leaves are 12.5 to 20 cm (4.9 to 7.9 in) long, with leaflets in two to four pairs. Lychee have a similar foliage to the Lauraceae family likely due to convergent evolution. They are adapted by developing leaves that repel water, and are called laurophyll or lauroid leaves. Flowers grow on a terminal inflorescence with many panicles on the current season's growth. The panicles grow in clusters of ten or more, reaching 10 to 40 cm (3.9 to 15.7 in) or longer, holding hundreds of small white, yellow, or green flowers that are distinctively fragrant. The lychee bears fleshy fruits that mature in 80–112 days depending on climate, location, and cultivar. Fruits vary in shape from round to ovoid to heart-shaped, up to 5 cm long and 4 cm wide (2.0 in × 1.6 in), weighing approximately 20 g. The thin, tough skin is green when immature, ripening to red or pink-red, and is smooth or covered with small sharp protuberances roughly textured. The rind is inedible but easily removed to expose a layer of translucent white fleshy aril with a floral smell and a fragrant, sweet flavor. The skin turns brown and dry when left out after harvesting. 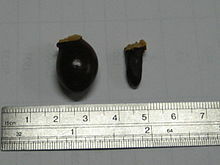 The fleshy, edible portion of the fruit is an aril, surrounding one dark brown inedible seed that is 1 to 3.3 cm long and 0.6 to 1.2 cm wide (0.39–1.30 by 0.24–0.47 in). Some cultivars produce a high percentage of fruits with shriveled aborted seeds known as 'chicken tongues'. These fruit typically have a higher price, due to having more edible flesh. Since the perfume-like flavour is lost in the process of canning, the fruit is usually eaten fresh. Cultivation of lychee began in the region of southern China, going back to 1059 AD, Malaysia, and northern Vietnam. Unofficial records in China refer to lychee as far back as 2000 BC. Wild trees still grow in parts of southern China and on Hainan Island. There are many stories of the fruit's use as a delicacy in the Chinese Imperial Court. It was first described and introduced to the West in 1656 by Michal Boym, a Polish Jesuit missionary (at that time Polish–Lithuanian Commonwealth). Lychees are extensively grown in China, India, Thailand, Vietnam and the rest of tropical Southeast Asia, the Indian Subcontinent, and in South Africa, Brazil, the Caribbean, Australia, Israel, and the southeastern United States. They require a tropical climate that is frost-free and is not below the temperature of −4 °C (25 °F). Lychees also require a climate with high summer heat, rainfall, and humidity. Growth is best on well-drained, slightly acidic soils rich in organic matter and mulch. A wide range of cultivars are available, with early and late maturing forms suited to warmer and cooler climates, respectively. They are also grown as an ornamental tree, as well as for their fruit. The most common way of propagating lychee is through a method called Air Layering or Marcotting. Air-layers, or marcotts, are made by cincturing a branch of a mature tree, covering the cut with a rooting media, such as peat or sphagnum moss, then wrapping the media with polyethylene film and allowing the cut to root. Once significant rooting has occurred the marcott is cut from the branch and potted up. According to folklore, a lychee tree that is not producing much fruit can be girdled, leading to more fruit production. When the central opening of trees is carried out as part of training and pruning, stereo fruiting can be achieved for higher orchard productivity. Lychees are commonly sold fresh in Asian markets. The red rind turns dark brown when the fruit is refrigerated, but the taste is not affected. It is also sold canned year-round. The fruit can be dried with the rind intact, at which point the flesh shrinks and darkens. 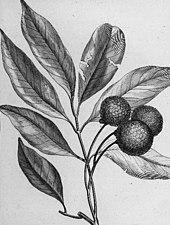 There are numerous lychee cultivars, with considerable confusion regarding their naming and identification. The same cultivar grown in different climates can produce very different fruit. Cultivars can also have different synonyms in various parts of the world. Southeast Asian countries, along with Australia, use the original Chinese names for the main cultivars. India grows more than a dozen different cultivars. South Africa grows mainly the “Mauritius” cultivar. Most cultivars grown in the United States were imported from China, except for the “Groff”, which was developed in the state of Hawaii. 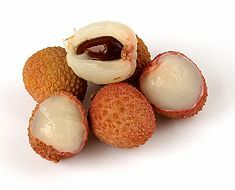 Different cultivars of lychee are popular in the varying growing regions and countries. In China, popular cultivars include: Sanyuehong, Baitangying, Baila, Shuidong, Feizixiao, Dazou, Heiye, Nuomici, Guiwei, Huaizhi, Lanzhu, and Chenzi. In Vietnam, the most popular cultivar is Vai thieu Hai Duong. In the US, production is based on several cultivars, including Mauritius, Brewster, and Hak Ip. India grows more than a dozen named cultivars, including Shahi (Highest Pulp %), Dehra Dun, Early Large Red, Kalkattia, Rose Scented. Raw lychee fruit is 82% water, 17% carbohydrates, 1% protein, and contains negligible fat (table). The raw pulp is rich in vitamin C, having 72 mg per 100 grams – an amount representing 86% of the Daily Value – but contains no other micronutrients in significant content (table). Lychees have moderate amounts of polyphenols, including flavan-3-ol monomers and dimers as major compounds representing about 87% of total polyphenols, which declined in content during storage or browning. Cyanidin-3-glucoside represented 92% of total anthocyanins. In 1962, it was found that lychee seeds contained methylenecyclopropylglycine (MCPG), a homologue of hypoglycin A, which caused hypoglycemia in animal studies. Since the end of the 1990s, unexplained outbreaks of encephalopathy occurred, appearing to affect only children in India and northern Vietnam (where it was called Ac Mong encephalitis after the Vietnamese word for nightmare) during the lychee harvest season from May to June. A 2013 investigation by the U.S. Centers for Disease Control and Prevention (CDC), in India, showed that cases were linked to the consumption of lychee fruit, causing a noninflammatory encephalopathy that mimicked symptoms of Jamaican vomiting sickness. Because low blood sugar (hypoglycemia) of less than 70 mg/dL in the undernourished children on admission was common, and associated with a poorer outcome (44% of all cases were fatal) the CDC identified the illness as a hypoglycemic encephalopathy. The investigation linked the illness to hypoglycin A and MCPG toxicity, and to malnourished children eating lychees (particularly unripe ones) on an empty stomach. Other assessment indicated that lychee contains "unusual amino acids" affecting gluconeogenesis and β-oxidation of fatty acids, contributing to acute illness. The CDC report recommended that parents ensure their children limit lychee consumption and have an evening meal, elevating blood glucose levels that may be sufficient to deter illness. Earlier studies had incorrectly concluded that transmission may occur from direct contact with lychees contaminated by bat saliva, urine, or guano or with other vectors, such as insects found in lychee trees or sand flies, as in the case of Chandipura virus. A 2017 study found that pesticides used in the plantations could be responsible for the deaths of young children in Bangladesh. ^ "Litchi chinensis". Germplasm Resources Information Network (GRIN). Agricultural Research Service (ARS), United States Department of Agriculture (USDA). Retrieved 2010-01-19. ^ Also sometimes spelled litchi, liechee, liche, lizhi, li zhi, or lichee. ^ a b c d e f g h i j Morton JF (1987). "Lychee in Fruits of Warm Climates". Center for New Crops & Plant Products, Purdue University, Department of Horticulture and Landscape Architecture, West Lafayette, Indiana. pp. 249–259. Retrieved 2013-10-30. ^ "Litchi chinensis subsp. philippinensis". Germplasm Resources Information Network (GRIN). Agricultural Research Service (ARS), United States Department of Agriculture (USDA). Retrieved 2013-10-30. ^ a b c d Courtney Menzel (2005). Litchi and longan: botany, production and uses. Wallingford, Oxon, UK: CABI Pub. p. 26. ISBN 978-0-85199-696-7. ^ a b c d e f Davidson, Jane L.; Davidson, Alan; Saberi, Helen; Jaine, Tom (2006). The Oxford companion to food. Oxford [Oxfordshire]: Oxford University Press. ISBN 978-0-19-280681-9. ^ a b c Hosahalli Ramaswamy; Diane Barrett; Laszlo P. Somogyi (2005). Processing fruits: science and technology. Boca Raton: CRC Press. p. 687. ISBN 978-0-8493-1478-0. ^ Andersen, Peter A.; Schaffer, Bruce (1994). Handbook of environmental physiology of fruit crops. Boca Raton: CRC Press. pp. 123–140. ISBN 978-0-8493-0179-7. ^ Kajdański, Edward (1999). "Flora Chin". Michał Boym: ambasador Państwa Środka (in Polish). Warszawa: Książka i Wiedza. p. 183. ISBN 9788305130967. ^ Juan González de Mendoza, The history of the great and mighty kingdom of China and the situation thereof. English translation by Robert Parke, 1588, in an 1853 reprint by Hakluyt Society. Page 14. The Spanish version (in a 1944 reprint) has lechías. ^ Crane, Jonathan H.; Carlos F. Balerdi; Ian Maguire (2008) . "Lychee growing in the Florida home landscape". University of Florida. Retrieved 30 June 2009. ^ Menzel, C.M. (January 1985). "Propagation of lychee: A review". Scientia Horticulturae. 25 (1): 31–48. doi:10.1016/0304-4238(85)90074-3. ISSN 0304-4238. ^ "Good management practices in litchi" (PDF). National Research Centre on Litchi, Bihar, India. 2016. Retrieved 24 November 2016. ^ Boning, Charles R. (2006). Florida's Best Fruiting Plants: Native and Exotic Trees, Shrubs, and Vines. Sarasota, Florida: Pineapple Press, Inc. p. 132. ^ Kadam, S. S.; Salunkhe, D. K. (1995). Handbook of fruit science and technology: production, composition, storage, and processing. New York: M. Dekker. p. 436. ISBN 978-0-8247-9643-3. ^ Pierre Brat; Stéphane Georgé; Annick Bellamy; Laure Du Chaffaut; Augustin Scalbert; Louise Mennen; Nathalie Arnault; Marie Josèphe Amiot (September 2006). "Daily polyphenol intake in France from fruit and vegetables". The Journal of Nutrition. 136 (9): 2368–2373. doi:10.1093/jn/136.9.2368. PMID 16920856. ^ Gray, D. O.; Fowden, L (1962). "Alpha-(Methylenecyclopropyl)glycine from Litchi seeds". The Biochemical Journal. 82 (3): 385–9. doi:10.1042/bj0820385. PMC 1243468. PMID 13901296. ^ "Litchi virus kills 8 kids in Malda". Times of India. 8 June 2014. Retrieved 12 June 2014. ^ a b Paireau, J; Tuan, N. H.; Lefrançois, R; Buckwalter, M. R.; Nghia, N. D.; Hien, N. T.; Lortholary, O; Poirée, S; Manuguerra, J. C.; Gessain, A; Albert, M. L.; Brey, P. T.; Nga, P. T.; Fontanet, A (2012). "Litchi-associated acute encephalitis in children, Northern Vietnam, 2004-2009". Emerging Infectious Diseases. 18 (11): 1817–24. doi:10.3201/eid1811.111761. PMC 3559149. PMID 23092599. ^ Singh HP, Babita S. "Lychee production in India". Food and Agricultural Organization of the UN. Retrieved 12 June 2014. ^ a b c Shrivastava A, et al. (30 January 2015). "Outbreaks of Unexplained Neurologic Illness — Muzaffarpur, India, 2013–2014". Morbidity and Mortality Weekly Report, US Centers for Disease Control and Prevention. 64 (3): 49–53. PMC 4584556. PMID 25632950. Retrieved 30 Jan 2015. ^ a b Barry, Ellen (31 January 2017). "Dangerous Fruit: Mystery of Deadly Outbreaks in India Is Solved". New York Times. Retrieved 1 February 2017. ^ "Pesticides May Have Caused South Asian Children's Sudden Deaths". Voa news. 25 July 2017. Retrieved 28 July 2017. ^ Mohammed Saiful Islam (2017). "Outbreak of Sudden Death with Acute Encephalitis Syndrome Among Children Associated with Exposure to Lychee Orchards in Northern Bangladesh, 2012". The American Journal of Tropical Medicine and Hygiene (Online). 97 (3): 949–957. doi:10.4269/ajtmh.16-0856. PMC 5590581. Wikimedia Commons has media related to Litchi chinensis. Look up lychee in Wiktionary, the free dictionary.